Sievers & Erdman is best remembered as an early producer of closed bodies for Cadillac, Paige, Wills Ste. Claire, Columbia and others. Although it wasn’t the firm’s specialty, they were an early producer of motor hearses and various iterations of the firm produced small numbers of professional vehicles through 1935. The Detroit, Michigan carriage building firm of Sievers & Erdman was formed in 1875 by two German immigrants, Henry Sievers and Charles Erdman Sr. and became well known for their elegant landau coaches, hearses and broughams. Henry A. Sievers was born in Uhrleben, near Magdeburg, Germany on August 31, 1841 to Henry and Marie (Homan) Sievers. He was educated in the public schools and apprenticed to a carriage maker at a young age. Following stints at a number of regional makers as a journeyman, Sievers left his homeland for the United States in 1868. On his twenty-seventh birthday he arrived in Detroit and found employment with John Patton as superintendent of Patton’s carriage factory. After six years with Patton, Sievers took a leave of absence to return to his hometown of Magdeburg for one final visit. Upon his return in 1875, he and another German immigrant, Charles Erdman, purchased the business and 3-story factory of his former employer and established Sievers & Erdman at the southwest corner of Brush and Woodbridge Sts., right where General Motors Renaissance Center stands today. The Patton factory had been a busy one, but the enthusiasm of the two young partners caused an immediate and progressive increase in business and in 1880 a new four-story brick structure was erected by Sievers & Erdman one block to the north at 294-298 Jefferson Ave, at the northeast corner of Jefferson and Beaubien. In 1885 Sievers married Lena Fischer, the daughter of Peter Fischer, who in partnership with his brother William, operated a wholesale jewelry store, P & W Fischer, at 217 East Jefferson Ave. for over forty-five years. Charles Erdman Sr. was born in Silesia, Germany on May 14, 1945. Educated at a school for orphans, he was apprenticed to a carriage maker at a very early age and by the time he emigrated to the United States in 1864, he was skilled in all aspects of the trade. He made his way to Detroit and found employment with Siewert & Lindemann, wagon makers, a firm which was formed by Wm. Charles Siewert in the years before the War Between the States. Located in the center of old Detroit at 179 Gratiot Ave., Siewert & Lindemann occupied a two-story brick manufactory where they produced heavy trucks and wagons for the city’s numerous retailers and businesses. In 1875 Erdman sold his share in the firm and entered into a partnership with Henry Sievers at the former John Patton coachworks. The pair built up a business of substantial proportions, and when they saw the decline in the use of the horse-drawn vehicle the firm concentrated its efforts and energies upon the manufacture of automobile bodies. By 1910—the year of his death—Sievers & Erdman was recognized as one of the city’s leading producers of automobile coachwork. In the course of purchasing lumber for the firm, Erdman often traveled to Saginaw, Michigan on business and in 1891 he married Emma Wilhelm, the daughter of a prominent Saginaw businessman. A January 9th, 1904 fire of unknown origin caused damage estimated at $50,000- $60,000 at Sievers & Erdman’s Jefferson Ave. factory. The loss was covered by insurance and soon after the factory had been rebuilt, Henry Leland, a Detroit-based engineer that was developing a new horseless carriage, approached them with an order for their first closed automobile body. 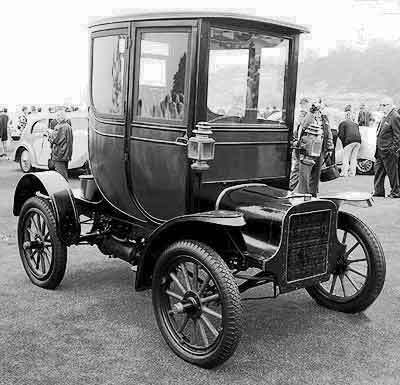 Sievers & Erdmann wood-framed and -paneled two-door coach body was fitted to Leyland's first concept car, the 1905 Cadillac Ocseola, which was named after the famous Seminole Indian chief. The Ocseola eventually entered production as the $1,350 Cadillac Model M coupe which was advertised as "The ideal Physicians Car, The Ideal Shopping Car and The Ideal Opera Car." Sievers & Erdman supplied most of Cadillac’s closed bodies prior to 1910; initially wood paneled, they were supplanted with metal body panels, first of aluminum, then steel. Charles Erdman (Jr.), born in Detroit, Michigan on November 6, 1893, obtained his early education in the public schools of Detroit and afterward attended the Howe Military school at Howe, Indiana. Following graduation he returned to Detroit to attend Central High School, from which he graduated at the age of seventeen. Due to the untimely death of his father in 1910, he immediately assumed a management position in his father’s business. Charles Jr. would eventually assume the vice-presidency of Sievers & Erdman and form another body building firm, the Erdman-Guider Co., where he also served as vice-president. Erdman was also a director of the Gray Iron Foundry Company (of Reading, Pennsylvania), a firm that supplied forgings and body hardware to the automobile industry. John Thieler Allmand, Sievers & Erdman’s longtime chief engineer and body designer, was born in Mt. Clemens, Michigan on September, 29, 1867, to John and Josephine (Deminos) Allmand. After a public education he was apprenticed to a Mt. Clemons coach builder, Donaldson Bros., where he was trained as a carriage trimmer and upholsterer. Following successful completion of his apprenticeship in 1887, he was hired by Sievers & Erdman, where he worked his way up, eventually becoming their chief body engineer and designer. He was also a shareholder and director of the firm and at the time of his departure was manager of their front office. Allmand left Sievers & Erdman within a year of the death of Charles Erdman Sr., to help organize the Fisher Closed Body Company where he served as both vice-president and plant manager. In 1916 he helped the Fisher Bros. and Alvar K. Ternstedt organize the Ternstedt Manufacturing Company. A native of Sweden, Ternstedt designed the first practical car window regulator for which he received a patent in 1916. His regulator utilized a chain and sprocket mechanism that offered greater ease of operation than any previous device and Fisher Closed Body was eager to utilize it their production bodies. On April 17, 1917, Ternstedt, the four Fisher Brothers, Allmand and two other Fisher shareholders elected Ternstedt chairman and Allmand, vice-president and manager. The firm moved into a modern factory at Fort Street and Livernois in downtown Detroit but unfortunately Ternstedt didn’t live long enough to see the fruit of his labor as he died six months later. At that time, the Fisher organization was already the largest body-building firm in the world and following the death of Ternstedt they purchased the entire Ternstedt operation. For a short time Allmand became the firm’s president, but when the Fisher Body took over the Shepard Art Metal Company, Allmand was installed as its vice-president. As an initial Fisher Body investor, Allmand was a very wealthy man and by 1922 he had retired from active management of their business although he remained an important advisor to the firm right up until his death. 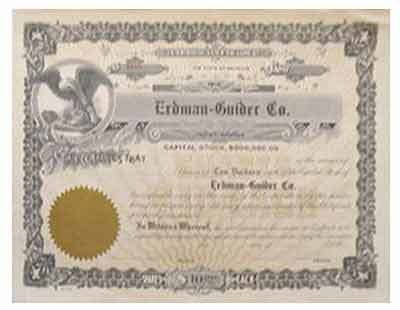 Arno Robert Guider, president of the Erdman-Guider Company, was born in Saginaw, Michigan on August 14, 1888 to William M. and Caroline (Schaper) Guider. After graduation from high school, Guider spent the next twelve years on the road as a sales representative for a number of implement manufacturers. Soon after the death of Charles Erdman Sr., Guider had the good fortune of meeting his daughter, Miss Agnes Erdman, and in 1913 they were united in holy matrimony. In 1915, his brother-in-law seized the opportunity to bring Guider into the body-building business, and the pair formed the Erdman-Guider Company which was headquartered in a former Roehm & Davison/Detroit Carriage Company plant which was located in the same block as Sievers & Erdman at 320 Beaubien St. Guider was president of the company, Charles Erdman Jr., vice president and H. L. Morrison, secretary-treasurer. 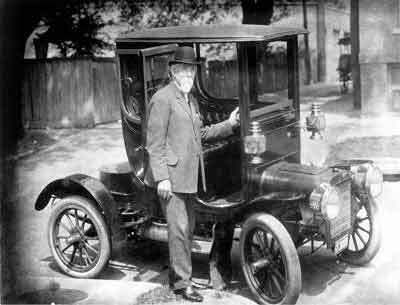 Morrison had previously held a similar position with the Detroit Weatherproof Body Company of Pontiac, Michigan, a manufacturer of completely closed tops for the Ford Model T.
On October, 3rd, 1916 Henry A. Sievers passed away at the age of 75 and control of Sievers & Erdman passed to Charles Erdman Jr. They remained in business primarily as a carriage and automobile coachwork refinishing concern as all new bodywork required by the firm was now supplied by Erdman-Guider. By 1919 neither Erdman-Guider, nor its corporate cousin, Sievers & Erdman, had the space needed to keep up with the expanding demand for closed bodies, so Erdman-Guider established a satellite plant in nearby Saginaw Michigan to supply the Detroit branch with bodies in-the-white. The plant was built at the corner of Salt and Holmes Sts., on land currently occupied by a General Motors (Delphi Saginaw Steering Systems plant no.2) plant. By 1922, Erdman-Guider’s 200,000 sq.ft. Saginaw plant employed as many as 500 hands and occupied ten and a half acres. Bodies in-the-white were shipped by truck to the Beaubien St plant in Detroit where they were painter and trimmed by 150 skilled craftsmen prior to their delivery to the customer. Erdman-Guider established a satellite plant at 2290 Woodward Ave. in the early 20s, but the firm disappeared from the Detroit directory in 1926. At about the same time another A.R. Guider-controlled business, the Guider-Sweetland Co., was established at 10226 Woodward Ave to handle auto trimming work formerly carried out by Erdman-Guider. Guider-Sweetland was also known for their budget-priced professional car modifications. Existing long wheelbase four-door sedans and limousines were turned into ambulances and funeral coaches by removing the B-pillar (center roof and door-frame post) between the rear and front doors providing easy access to the rear compartment for a gurney or casket. Guider-Sweetland’s pillarless side-loading sedans were easily converted into 9-passenger limousines and pall-bearer’s coaches with the addition of two rows of rear seats, similar to a modern-day 9-passenger Suburban. Guider-Sweetland is occasionally listed as a Lincoln custom coachbuilder but flashy classic-era phaetons and roadsters were not the firm’s specialty. The firm survived the Depression, but vanished from the city directory in the late 1930s. Sievers & Erdman remained in business into the early 30s primarily as an autobody repair and re-painting facility. They also are known to have considered the manufacture of refrigerators under the Ice-O-Matic trade name, but were forced to abandon that moniker after the Icy-O Metal Products Co., successfully sued them for trademark infringement. The firm disappeared from the city directory in 1936.